Well I guess I am probably going to be in the minority here so I am just going to put my thoughts and opinions out there. But these are just that, my thoughts and opinions. I absolutely loved Here With Me, I loved the way the story was told, loved the characters and the plot was really building to something intriguing. 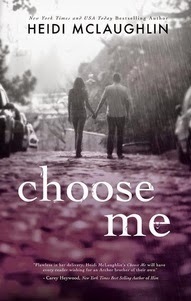 I had been anxiously awaiting Choose Me, I was desperate to know what had happened, why it had happened and most importantly, who won the girl. This was a love triangle with a difference, even if you are not a fan of them I would still ask you to give this story a chance because it is far from traditional and technically there is no cheating involved. There are emotions running high and decisions to be made but I desperately wanted to know who was going to fight the hardest and walk away the winner. This is where my disappointment comes in, in my opinion, nobody “won the girl.” There was no fight, no battle, the characters seemed to do a total 180 from Here With Me and I hardly recognised who I was reading about on the page. The author took that fight away by lazily introducing another character. That battle to win was taken from the reader and the author tried to deliver two couples for you to love. It was too convenient and too predictable and unfortunately for me, disappointing. Evan really changed in this book, I felt no connection between him and Ryley and more importantly I did not felt any connection between him and EJ. He actually became rather mean and totally unlikeable. I appreciated his circumstances and tried hard to understand why he said some of the things he said but I just couldn’t “get him.” As I said above, I just couldn’t connect to him at all; he was so different from the Evan in Here With Me. Ryley baffled me, I appreciate that she was in an impossible position but to toy so openly with both Evan and Nate’s emotions was cruel and totally not her character. To go from kissing one brother to the other was totally out of character and for a person that demanded space to get her thoughts together she didn’t really stick to the deal. Nate just kind of gave up, I was so disappointed, he was willing to stand on the side lines and see if Ryley threw any scraps his way. Nate was a fighter and to see him capitulate actually hurt. I am glad that he finally saw some flickers of light and began to play the same game Evan played. The rest of the plot I loved, it was interesting and intriguing. The who’s, what’s and why’s were all answered but not before a lot of plot twists were revealed. Heidi McLaughlin keeps you guessing until the end and I was glad they all got the answers they deserved. While I didn’t love this book, I have enjoyed this series. Maybe because I loved Here With Me so much I had just put Choose Me on too big of a pedestal, maybe my expectations were too high. But overall, an interesting read that I would still recommend. These are just my thoughts but I pride myself on being honest, it is not often I give a critical review but I loved these characters so much in Here With Me that I felt I just needed to defend them somehow.